When the King of France, Louis XIV, first decided to build a new palace and move his court out of Paris, there was nothing on his chosen site at Versailles but a smallish hunting lodge. Today, the palace stands as a prime example of the over-the-top excesses of the French nobility that led to the French Revolution. 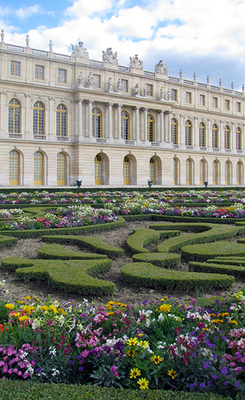 Thanks to the team of Louis le Vau (architect to the aristocracy), André le Nôtre (landscape designer extraordinaire), and Charles le Brun (über-fashionable interior decorator and painter), Louis XIV’s enormous and stylish palace was completed 21 years after it was begun in 1661 allowing Louis (and his closest friends, family, courtiers, servants and soldiers—all 20,000 of them) to officially set up court there (by that point, the next superstar architect, Jules Hardouin Mansart, had taken up the design reins). Enormous is no joke. The place has 700 rooms, 2,153 windows, and takes up 67,000 square meters of floor space (for those of you keeping track at home, that’s over 12 American football fields or a bit more than 9 soccer pitches). Over and above anything else, Versailles was meant to emphasize Louis’s importance. After all, this is the guy that called himself The Sun King; as in, everything revolves around me. “L’état, c’est moi” (I am the state), he said, famously and oh-so-modestly. By building Versailles, Louis shifted the seat of French government away from the feuding, gossiping, trouble-making noble families in Paris. He had the whole palace and its massive gardens built along an East/West axis so the sun would rise and set in alignment with his home. And he filled both the palace and its gardens with sculpture, painting, and fountains that all focused on…you guessed it…himself. 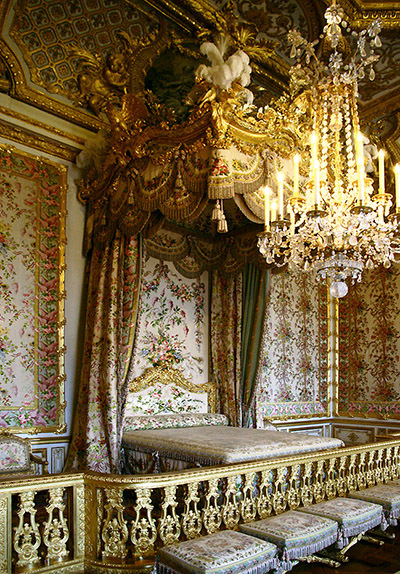 When you walk through the palace at Versailles, you’re bombarded with room after room of marble and gold and paintings: ceilings painted to place Louis in the company of the Greek gods, busts of him in a huge formal curly wig staring at you wherever you go, and gold gold gold, so you never lose sight of how wealthy the King of France was. To give you just a hint, we’re talking about a man who spent the equivalent of $5,000,000 on buttons over the 54 years of his reign. That’s an average of almost $100,000 a year. On buttons. Of the 700 rooms inside the palace, there are a few notable ones that served very particular functions. The king’s official state bedroom is one, where the incredibly detailed lever (rising) and coucher (going to sleep) rituals would be performed each day. Both involved a whole host of courtiers waiting on the king while he got up or went to bed, following strict rules of position and rank to determine who got to perform which parts of the ceremony. The queens of France who lived at Versailles were the focus of a similar ritual (the Toilette) in the queen’s main bedchamber, a room where they also gave birth in public. The symmetrical Salon of War and Salon of Peace are decorated with paintings highlighting, unsurprisingly, France’s military might and the benefits of living calmly under a tranquil ruling government. And the Cabinet des Chiens (literally, the Study for Dogs) was a room that Louis XV’s valets shared with his dogs, who also got to sleep in a room full of gilding and painted decoration. 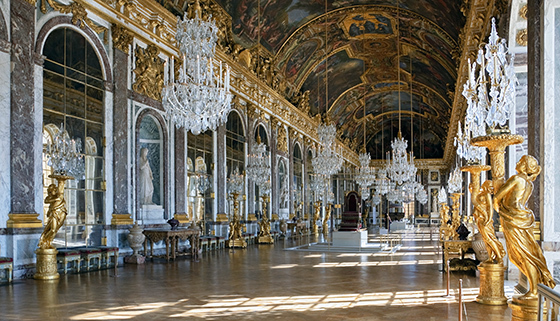 The most famous room is the Hall of Mirrors, which runs along the entire length of the central building. One wall contains a row of giant windows looking out over the gardens (almost 2,000 acres of manicured lawns, fountains and paths arranged in the formal garden style that André le Nôtre was known for), and the other wall is covered with 357 mirrors that catch the rising sun’s rays inside the palace and remind us yet again (as if we could forget) of Louis XIV’s power. Though the room is over the top in its grandeur, it was mainly used as a passageway. After the king got up for the day, he proceeded through this mirrored hall to his private chapel, and as many courtiers as could fit would squeeze in, waiting for their chance to beg a favor of the king as he passed by them. Since Louis XIV’s day, the room has also been used for parties (the masked ball for the wedding of Louis XVI and Marie Antoinette) and military agreements (the Treaty of Versailles that officially ended World War I was signed here in 1919). The palace’s outside isn’t as ornate as its inside. Sure it’s still huge, and sure it’s still got plenty of gold and statues and embellishments, but the basic structure is classical; it’s symmetrical, repetitive, and based on simple elements that are directly borrowed from ancient Greek temples. The façade that faces the gardens looks remarkably similar to the White House in Washington, DC, albeit much bigger and not so white. Before you go thinking that this is a sign of Louis XIV’s hidden modesty, keep in mind that classical architecture was intended to remind people of the greatness of the antique Greek and Roman past (Greek and Roman civilization were often lumped together and called classical). When Versailles was being built, this ancient past was seen as the root of the intellectual and aesthetic superiority they believed had descended to the French nation. Classical architecture was the name of the game at Versailles, and although it wasn’t as complicated as some of Louis XIV’s other choices, he was making a direct link from himself all the way back to the great thinkers and builders of the ancient, classical, past. Louis, ever modest, especially liked linking himself directly to the Greek god Apollo (Sun King = Sun God… subtle wasn’t Louis’s middle name). 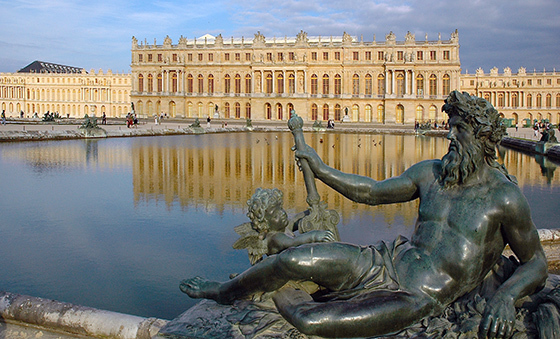 The Apollo Fountain and Apollo Salon remain two of the major highlights of a visit to Versailles. Not content with the restraint of pure classical design, he had his team create a palace that used classical structures to contain the elaborate grandeur of the Baroque style that was all the rage in the mid-seventeenth century. 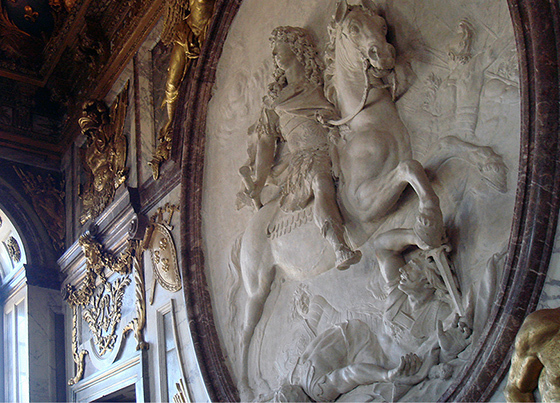 He wanted to make the biggest possible statement and what he ended up with was Versailles: a palace designed to glorify the French monarch by incorporating both ornate Baroque decoration that amply demonstrates his wealth and glory and the stricter rules of classicism that express his intellectual and cultural stature. Cite this page as: Rachel Ropeik, "Louis le Vau, André le Nôtre, and Charles le Brun, Château de Versailles," in Smarthistory, August 8, 2015, accessed April 22, 2019, https://smarthistory.org/chateau-de-versailles/.